OEM Timing Belt Kit & Water Pump, Hydraulic Belt Tensioner. Crp/Contitech Kit Aftermarket Water Pump Aftermarket Hydraulic Tensioner. TB306K2 and 06B109477A and 06A121011L. INTERCHANGE (Vehicles this part fits). 1.8L; From 8/00; VIN 8D. W/ Belt; Idler; Tensioner Roller; Tensioner. PLEASE READ BELOW BEFORE PURCHASING! 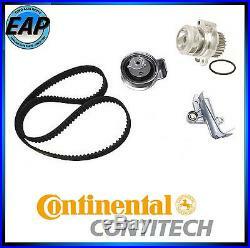 The item "For Audi A4 VW Passat 1.8L 4cyl OEM CRP Timing Belt Kit & Water Pump withTensioner" is in sale since Friday, May 04, 2012.